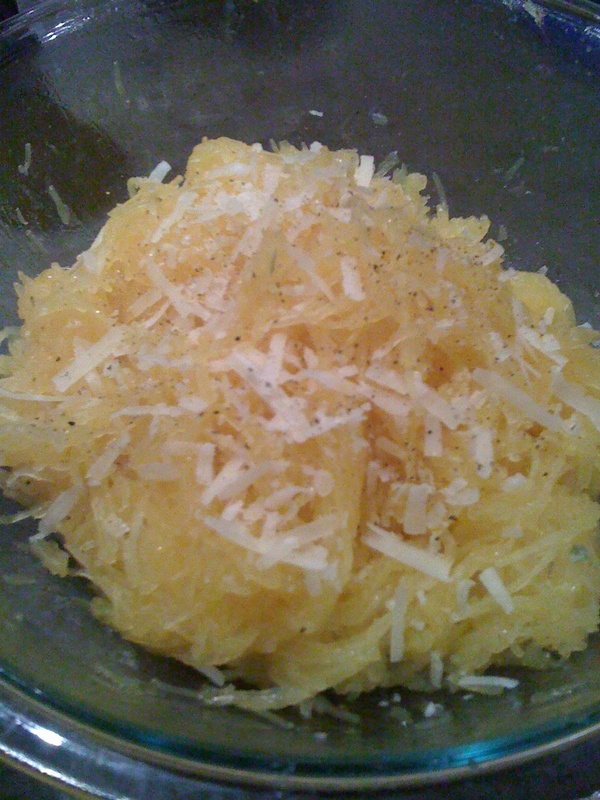 I picked up a spaghetti squash, a favourite, at the market last week. I made a version of this classic Italian recipe swapping out the pasta for the squash, it is delicious and a great accompaniment to your dinner plate. Squash takes a bit of time to cook, but it’s worth it. By the time you do everything else to prepare a meal, it is ready AND you can eat it for dinner or lunch through the week, just put in the fridge. Pre-heat oven to 350 degrees. 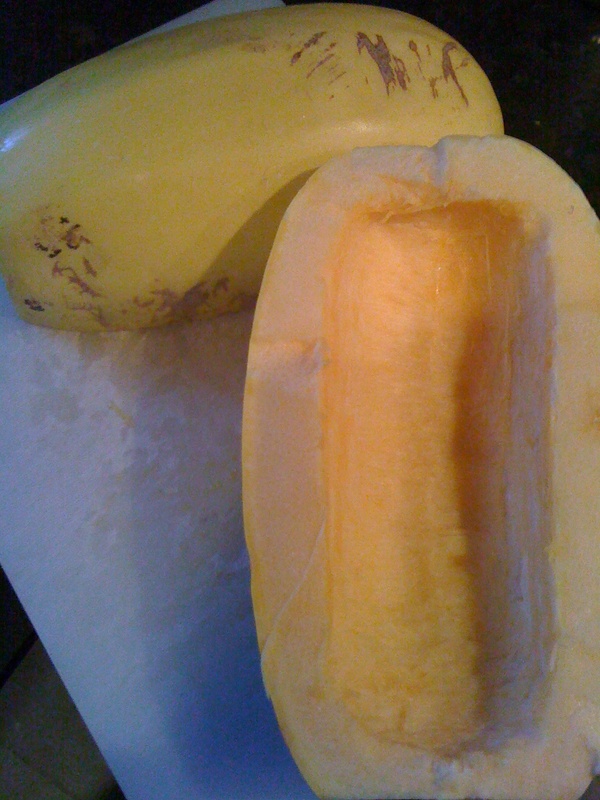 Cut the stem end off the squash and slice lengthwise. Scoop out the seeds. In a roasting dish place them cut side down, add about 1/3 cup of water to the pan. Bake until they are tender, but not soft, about 1 hour. I check them at 45 min by removing the pan from the oven, turning one over and lightly scraping the squash and tasting a strand or two to check the consistency. You don’t want to over cook or it gets mushy, yuck. When it’s done, al dante, let it sit for a moment or put an oven mit on to hold the squash while you scrape the flesh out using a fork. Go right to the skin, lengthwise putting the stringy squash into a bowl. If using the garlic, then in a saute pan heat the oil, add the pepper flakes and garlic until lightly brown, add the squash and oregano, toss and serve. If you are not using the garlic, just add the pepper flakes, olive oil and oregano right to the squash and toss in the bowl, that’s what I did. Serve with parmesan cheese sprinkled on top, or toss together. Yum. This is been something I’ve been wanting to try but I’ve been too daunted! Thanks for the play by play Nat! I just bought a squash yesterday, Nat. How timely. Yum. Thanks for inspiring me.